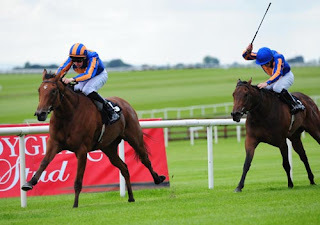 Saturday saw an impressive performance from Camelot in the 2,000 Guineas to overcome all sorts of statistics against him & a distance that will surely prove an insufficient stamina test in the future, it was a triumph of the impressive Coolmore operation that has the best breeding, buying, facilities & trainers & they can taste more success in the 1,000 Guineas with Maybe. Although there were reasons to oppose Camelot in the 2,000 at some originally prohibitive odds (5/4 was being quoted on Friday) it is impossible to find holes in anything that Maybe has done. The Galileo filly won all five of her two year old races progressing perfectly up the grading ladder by winning her maiden, then a listed & then Group 3 to Group One in order & doing it with the minimum of fuss for the most part & over every type of ground other than really firm. She's never won over the mile distance having won her last four races all over a furlong shorter but the step up shouldn't be an issue as she's shown plenty of stamina by taking races by the scruff of the neck plenty early enough. The other Group One winners here are Lightening Pearl & Lyric Of Light but Lightening Pearl's wins last year were coming over 6 furlongs on quick ground & was put in her place by Maybe when encountering yielding going - this looks the wrong race for her & it's strange that connections haven't changed their plans. Lyric Of Light has great connections being from the Godolphin operation & Frankie Dettori has selected her ahead of stablemate Discourse, she's unbeaten but those last two wins were only by a neck & a head respectively & she'd need to improve a fair few pounds to trouble the selection here. The biggest challenge could come from French challenger Mashoora who has the services of Christophe Soumillon on her back & trainer Jean-Claude Rouget wouldn't be sending her without a good chance. We don't buy into Moonstone Magic at all even though connections have paid to supplement her entry, she only made her debut in April & although she'll like the ground we're doubtful she's a future Group One winner. Stick with Maybe to deliver up an easy victory at odds of 6/4, she should get a tow into the race from an ideal central draw & expect to see her take it up around two furlongs out & put it to bed quickly. In the Pretty Polly stakes we reckon that Hazel Lavery can defy giving her rivals three pounds to win the race at odds of around 5/1. Charlie Hills filly has already won in softish conditions & placed second in a very valuable sales race at the end of last year & that is by far the best form on offer in this field of 11. Salford Art actually has a higher rating courtesy of a 4th in the Group One Fillies Mile but she was some way back from Samitar that day & that rival was only just over a length in front of Hazel Lavery in the Tattersalls Millions so through that line she's held. 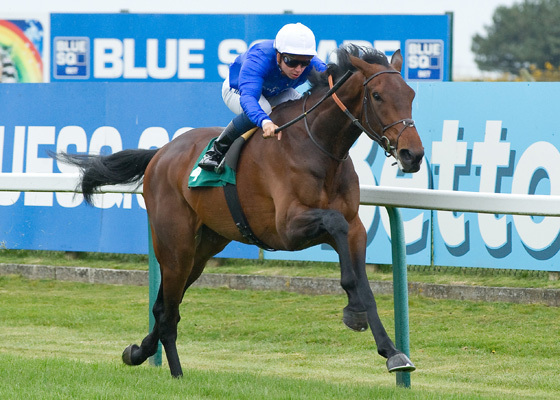 Godolphin run two in the race & Lacily looks likely to be the favourite but she's only had the one run, winning a decent Doncaster maiden - the positives with that race are that it was over a mile (a furlong further than Hazel Lavery has contested) & it was soft enough that day. The only one to have raced this season that looks up to this level at the moment is probably Arsaadi who came third over course & distance in another mega money sales race two & a half weeks back, she was a little way off the first two though & has Ahmed Ajtebi on board - we are not fans. With a little bit of big race experience (18 runners in her sales race) & two runs at the track we're pretty sweet on Hazel Lavery & at odds of 5/1 she can be backed each way as a bet to nothing, she'll surely finish in the first three if tuned up & if it comes down to a battle we're confident she'll win. 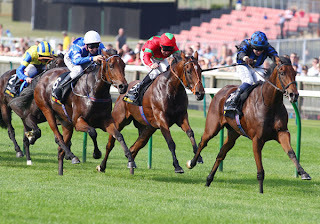 In the final race of the day we can't get away from the top weight, Godolphin's Samba King, having seen him win easily at Yarmouth (beating a fancied stablemate) & then again at Sandown off a mark of 84 we don't think his improvement has finished & he'll deal with a 9 pound rise in the weights. He's a big type with a lovely round action that helps in this ground, he won 9-6 last time & doesn't seem to mind carrying the weight & Dettori seems to only be on the other Godolphin horse because Mikael Barzalona has struck up a good partnership with this one. There are probably improvers in this field but they'll have to go some to beat this race fit gelding who looks plenty tough enough & seems to relish these testing conditions, back Samba King at odds of 9/2.